A rather beautiful large flowering Australian Native plant is Guichenotia macrantha. A plant that should perhaps receive more attention from landscapers for its wonderful flowers and foliage. Found in the south east of Western Australia and are related to Thomasia. G. macrantha is the largest flowering of the genus and the best for general garden use. 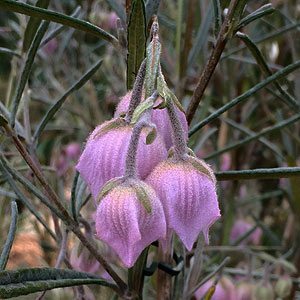 Growing to about 1m Guichenotia macrantha has delicate bell shaped or lantern shaped pink to mauve flowers, it also has attractive foliage which is sought after by florists and well suited for use in floral arrangements. Flowering from mid winter through to early summer this is a plant that adds interest to the garden for much of the year. Guichenotia are a drought tolerant plant, but needing some protection from frosts. Although they naturally grow in poor soils, they will perform better in a free draining soil with some added compost or other organic matter. Plants need to be firmed in to the same level they were in the pot, watered in with a liquid seaweed fertilizer and get moist through the first summer. At no time should the soil be allowed to become soggy. Guichenotia make an excellent rockery plant. Guichenotia flower during winter and early spring adding a touch of magic to the garden with the grey foliage and very pretty flowers. Guichenotia micrantha is a smaller flowering species. In botanical terms, macrantha means large flowers, micrantha means small flowers. Guichenotia ledifolia is another of the species worth exploring, a more compact and denser species than others.